Many moons ago I used to review movies. I loved doing it too, and went to some awesome screenings and press conferences - heck I was in the same room as the entire cast of the Avengers! Yes, I was twenty feet away from Scarlett Johansson and Tom Hiddleston without passing out. Getting to these screenings was pricey and soon fell outside of my budget, and the big Marvel movies didn't really need press conferences and screenings to get people interested - people were going to see them no matter what! - so my movie reviewing seemed to have been left by the wayside. However, I still get invites and review offers for some of the coolest indie movies around, and last month I was offered the chance to check out the new documentary Being Frank: The Chris Sievey Story. I couldn't make it to the screening, but my very good friend Maz Webster went in my place and really enjoyed it. Anyway, enough of me waffling on, here's Maz with her review of Being Frank. This is a portrait of the man underneath the over-sized papier-mâché head of Frank Sidebottom, Chris Sievey. A good looking, hugely creative man. One that saw himself as a pop star, and could have achieved such status but didn’t fit into the Manchester music scene of the time. With his band, The Freshies, he released a few pure pop Manchester singles but they never quite broke out. Frank Sidebottom first appeared at a Freshies gig as a fan. This appears to be the start of a split personality which intimately consumed its creator. Being Frank is an affectionate film including interviews with some of the privileged few who knew Chris Sievey and including well known fans such as John Cooper Clarke and Johnny Vegas. This comical and moving story is told through extensive images, music and tapes made by Sievey himself. Starting with him as a young man, this is a portrait of a family man who had a fun and unique approach to fatherhood. Often making videos with his children, this is a man who lived and breathed art in all forms. Apparently never disheartened when a project failed to take off, he would just move on to the next idea. 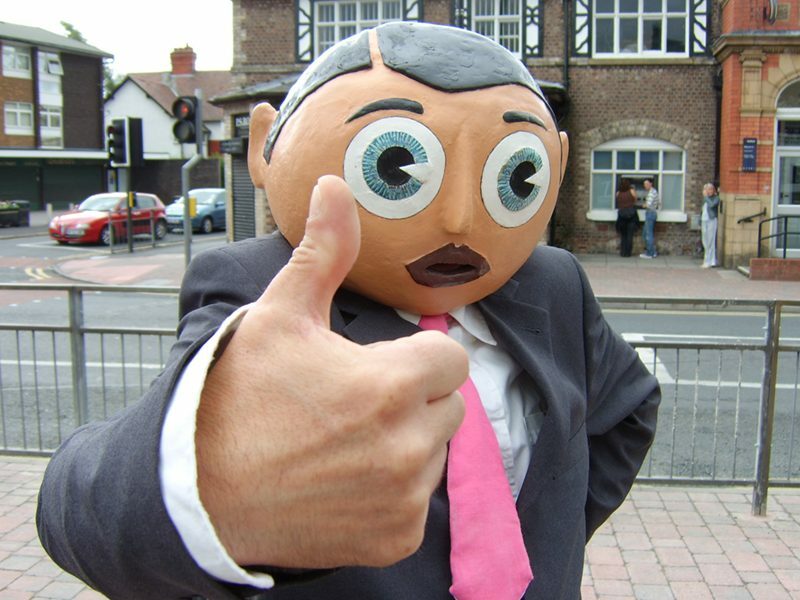 Frank Sidebottom was just meant to be a fun character but became a legendary Manchester personality putting the suburb of Timperley on the map. Sidebottom was often on television, released records, produced a comic and made many live appearances particularly through the ‘Madchester’ time of the late 1980’s. 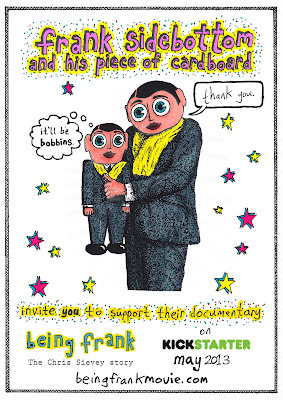 Frank Sidebottom allowed Chris Sievey to express his art and claim the fame he sought after. The alter ego however, started to overtake his true personality and a double life was truly formed. This is a thoroughly enjoyable film and is totally fascinating and inspiring. The world has lost a fantastic artist and human being. It’s time to bring Sievey and Sidebottom into your life. It really is. 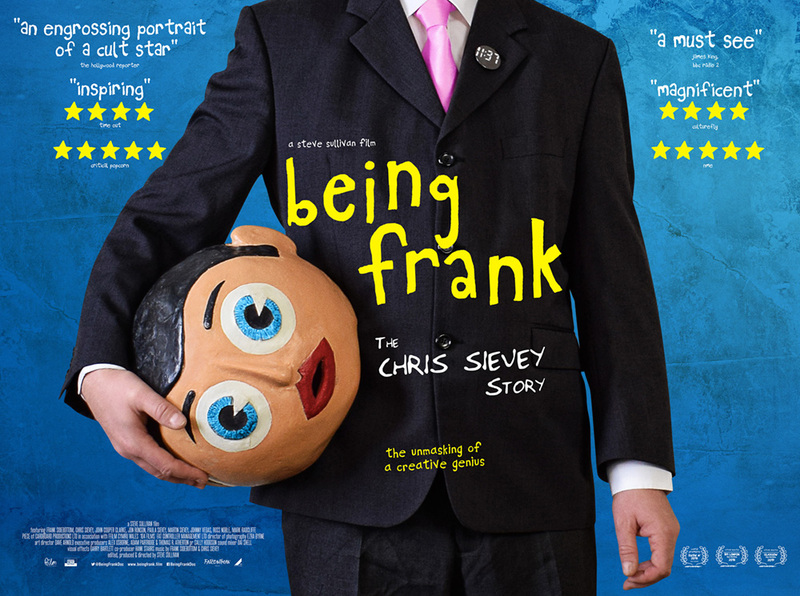 Being Frank: The Chris Sievey Story is released in cinemas in the UK on 29th March 2019 by Altitude. For further information, check out the official website for the movie at www.beingfrankmovie.com and check out the trailer below. Relics: A Game of Angels really ticks some major boxes in appealing to me. First of all, it uses Tarot as a mechanic for task resolution (and other cool elements). It also is about angels, which is very cool. And also, it's written by Steve Dee who I've known from the days of playtesting Conspiracy X 2.0. Sure, I may be a little biased, but you need to see what is sure to be a very cool Kickstarter launching next month. Relics uses the Fugue System as designed by James Wallis that first appeared in his game Alas Vegas (which I mentioned last week in the blog). In Alas Vegas the basic premise was that the characters woke with no knowledge of who or where they were, and the game gradually filled in those details as the story progressed. The Tarot cards are used for task resolution using Blackjack (or "21") as the main system. However, in Relics the characters know who they are - they are angels stranded on Earth. 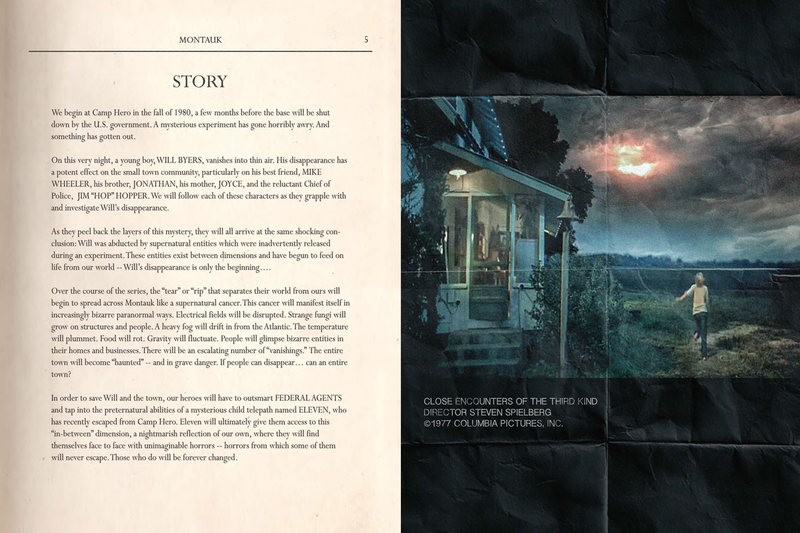 The memory recovery element is still present, but the players start with a definite feel for who their character is, as they struggle against demons, creatures and some humans, to try to save the world from itself. Instead of remembering who they are, the mechanic cleverly allows players to recall skills or information that will help them in times of need, filling in the character's backstory as the game progresses. The player determines the skill they need to "remember" but another player narrates the memory. In addition to this, the angels can discover and reconnect with powerful relics that have powers and abilities that could aid them in their fight, or have the opposite effect. While the game could be a pure fight against demons and evil forces, the inclusion of these relics adds an element of hunting for hidden and powerful items, racing against time and demonic powers to gain control of them before they fall into the wrong hands. I've been reading the playtest document for Relics and I'm really enjoying the use of the Fugue system for it. It seems like a perfect marriage of system and setting as the characters uncover elements of their past that can influence their actions now. The Tarot cards are used in additional ways in Relics, coming into play in character creation (though in a faster way to that which I've been toying with in WILD) as well as generating random miracles, and other narrative effects. It is going to be hard to review or preview Relics without mentioning other angelic roleplaying games, and this really does feel like it could be an excellent successor to the incredibly popular RPG In Nomine, (originally In Nomine Satanis/Magna Veritas) that was big in the late 90's. And that's not a bad thing to be compared to as I loved In Nomine. Relics also has echoes of TV series such as Lucifer and Supernatural, and movies like The Prophecy, though the tone of the game is certainly a lot darker. Another fantastic element that the game has going for it is the design of the Tarot cards. Remember a couple of posts ago I talked about the original Mage: The Ascension game and the Mage Tarot that was produced to accompany it? It is still one of my favourite decks and the artwork is fantastic. Well, it seems that Dan Smith (aka SMIF) who did some of the artwork for the Mage Tarot, as well as most of the illustrations for In Nomine, is on board as artist for the Relics Tarot. With that, and Steve Dee's writing, and a great use of the Fugue system, it looks like Relics could be a huge success. 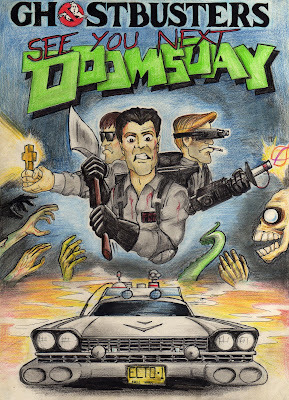 Definitely check it out when the Kickstarter - you can find it here! Over the last two weeks I've been chronicling my relationship with the Tarot, and how it has inspired and influenced my gaming and art. Onto the final part (with an epilogue to follow). When I started working on WILD, my RPG of dreamsharing, my natural assumption was to continue with the system I knew the best - Vortex, the game system I'd designed for Cubicle 7's Doctor Who RPG. It seemed to work for just about anything with a few tweaks, and I started stripping the system down to be even simpler. Four Attributes, and five "Skills", though these skills were more like roles or archetypes to begin with. These skills were initially inspired by the most influential source for the game, with names like Forger, Architect, Pointman, Shade, etc. and I'd had a moment of clarity for the name of the game system - Rapid Die Movement. But the more I thought about it, the more I wanted to incorporate a set of Tarot cards into the game. I thought the randomness of dreams could be inspired by using a card draw (when the primary dreamer loses control over their own dreamscape) and some of the Tarot images could incorporate some of the list of 100 common dreams that I'd compiled. Then I started to wonder - why am I using dice for one thing, and cards for another, when I could just use the Tarot for everything - randomness, task resolution, and even character creation? 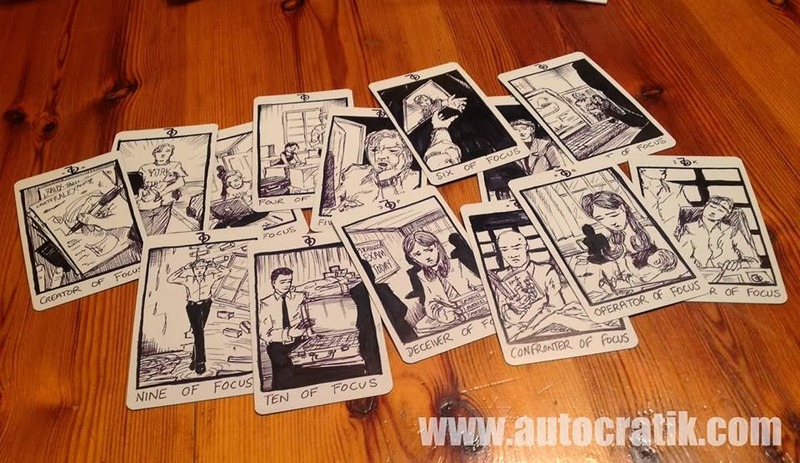 Character creation was the real moment I turned my attention purely to the cards - if you lay out a spread of Tarot cards that look at your past to divine the future, why not use the Tarot cards to inspire and guide through character creation for the game? A detailed background is essential for WILD, as images from your past may surface in your dreams. Much as I hated to say goodbye to the name Rapid Die Movement, I put the dice away and started to focus on the cards - their symbolism, alternative uses, and how they could work in task resolution. In order to do that, I thought I'd check out some other roleplaying games that used cards as a mechanic. First one I was recommended was sitting on my gaming shelves. Everway was been a great influence in the way it looks, the design and the production. It's a rather gorgeous set that was way ahead of its time. Using two decks of cards - a Fortune Deck that was used for action resolution, and a Vision Deck that could be used to inspire encounters, quests and adventures. It came in a big box with three books and a handful of character sheets. To my regret, I've never played it, but the way the cards are used to randomly inspire the adventure, and other cards are used to resolve tasks, has been quite inspirational. Once I'd decided to go the Tarot card resolution route, I actively sought out roleplaying games that used Tarot as a mechanic. Mostly to make sure that whatever mechanic I was using hadn't been done exactly the same way before! People have pointed me to Castle Falkenstein (which I haven't managed to check out yet, but have read up on), and to a quirky game called Psychosis - Ship of Fools. Psychosis - Ship of Fools is an odd game in the fact that it was a set storyline designed to be played in about 4-8 sessions. The first of a line of Psychosis games, the second being Solitary Confinement (which I haven't read yet... must hunt that one down) the game involves the players waking in very different environments and trying to figure out who they are, where they are, and what the hell is going on. The Tarot are split into two piles - Major Arcana and Minor Arcana. The Minor Arcana is used to determine task resolution (Wands are strength, Swords are agility, Coins are knowledge and Cups are intuition). The Major Arcana are drawn at special times in the game, when really major reality shifting stuff can happen. Very interesting! More recently, I'd backed the Kickstarter of James Wallis' Alas Vegas, utilising Wallis' Fugue System, using Tarot cards for task resolution (with extra effects). Like Psychosis, Alas Vegas' gameplay is structured for a limited experience, taking place over four 3-4 hour sessions with a rotating GM. And, also like Psychosis, the characters wake with no memory of who they are or what's happening. The game answers these questions as the players progress. Task resolution is done by playing Blackjack (or "21") but all of the cards are in play, with the Major Arcana's numbers representing their value (special effects happen if you can 21 with 0: The Fool and 21: The World). Again, very interesting, and thankfully not the same system as I had in mind. Until then, I'll keep playing with those cards until something drops. Next week, continuing the theme of games that use Tarot cards, and following nicely along from Alas Vegas, I'm going to take a look at Relics - A Game of Angels - a game coming to Kickstarter in a matter of weeks that uses the same Fugue system. Until next time, stay multi-classy! Last week I thought I'd start a series of blog posts about the Tarot, and how I've been influenced by their use and design over the years. On to part 2! I got into University, or Art School as it was then before it gained full University status, with a very clear purpose. I was going to draw comics. 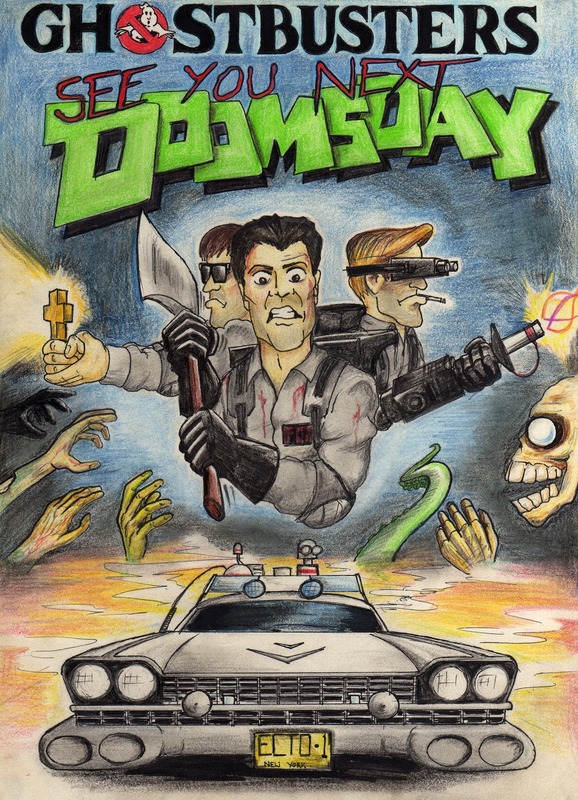 I loved comics, and I'd teamed up with some of my RPG group to publish some comics including my first title - Drowning in Darkness. How cheery! After the review that called me the "Goth Hergé" I was more determined to pursue my comic career. You can read more about that, my comic publishing company that was, and the few titles I released here. While attending Uni, I started hanging out at the local comic shop (Abstract Sprocket) and continued my obsession with all things Vertigo. I loved the Sandman, Shade: The Changing Man, Kid Eternity, Enigma and The Invisibles. Almost everything they brought out I loved. 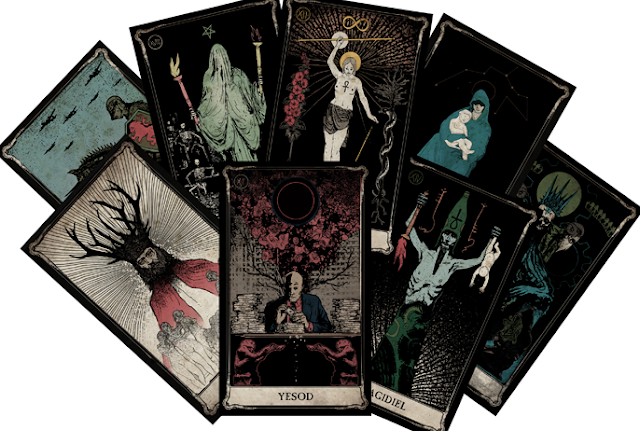 So, when the lovely purveyor of comics at Sprocket showed me the listing for a rather special collectors item - The Vertigo Tarot - I put in an order straight away. The Vertigo Tarot set, published by DC Comics in 1995. Gorgeous! What sold it to me was not only the use of Vertigo characters for the Major Arcana (The Fool is an image of John Constantine, The Empress is Titania, Queen of the Fairies from Books of Magic), but the artwork was by Dave McKean - someone whose art I've admired for years. It's a huge set, in a big white box (strangely the same size as the fabled Nobilis 2nd Edition) with the deck, and a hardback guide book that explains the images and divinatory meanings, written by Rachel Pollack. While I'd been aware of her writing from her time on Doom Patrol, I didn't know she was an authority on the Tarot as well. As I read, my eyes were opened to how the cards worked, and Rachel's explanations have become my instant go-to for Tarot readings. However, a weird thing happened. Inspired by how cool the cards were, and the clear and informative write ups in the accompanying book, I started actually doing Tarot readings. And the weirder thing is - they seemed to be strangely accurate. I had no idea what I was doing, and maybe that is the power of the Tarot and its iconography - with the vaguest of interpretations the questioner applies the meaning to their lives and it suddenly all makes sense. At Uni I rediscovered my love of tabletop roleplaying. When I'd gone into work, and then on my Graphic Design course, I'd almost put the RPG writing side of things away. I was concentrating on the comic production, and getting into Uni, and RPGs didn't really seem to be in my life. However, when I relocated to Uni I quickly fell into a game being run by my fellow students. A game that had become huge in the early 90's - Vampire: The Masquerade. The reawakening of my gaming interests has been covered before in my blog, waaaay back here. We played a lot of Vampire, and then I kinda went off and started a new game with new players continuing the World of Darkness setting, moving over onto playing Mage: The Ascension. Wow, I loved that game. Our Mage game was huge, epic and bonkers, with some massive Paradox Backlashes that distorted reality. It inspired Debs to write her fiction, and I had my eyes opened again when they released the Mage Tarot set. We were very into Mage: The Ascension in a big way, so much so that Debs was the one who actually bought the Tarot set. As a card carrying Wiccan (as she liked to call herself) she took the cards very seriously, keeping them wrapped rather than boxed, and I was only allowed to handle them for short periods of time (something I respect even now - I touched them enough to put the cards on the table for the above photo before putting them carefully away). 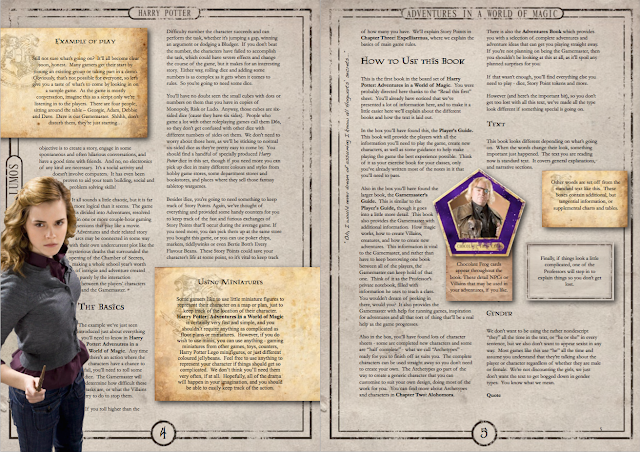 The cards came with a little book of how to read and interpret them, though there was also a short section on using the cards to help with the RPG itself. However, the cards themselves were another revelation. Exchanging the traditional suits from Cups, Coins, Swords and Wands to Dynamism, Questing, Pattern and Primordialism was a revelation to me. You could change the suits? And use them in a roleplaying game? The next incarnation of Mage (Mage: The Awakening) would explore this in even greater detail with a whole book called "The Keys to the Supernal Tarot" which looked at each card and how they could be used to inspire storylines and adventures. Excellent! Also helps that the art in this newer edition was bloomin' gorgeous! Anyway, back to the right place chronologically. I had a strange moment when I wanted to continue our game but I had turned my back on the World of Darkness. I managed to fill the hole in my urban horror/magic/occult gaming with a completely different system - KULT. Again, that connection between tabletop gaming and the Tarot would come to the fore when I picked up a supplement for KULT called Taroticum. At its heart, Taroticum is a series of adventures that revolve around a deck of Tarot cards that can shape reality. It's an epic adventure where the characters must basically travel from London to Hell to create a missing Tarot card for the deck to save creation itself. 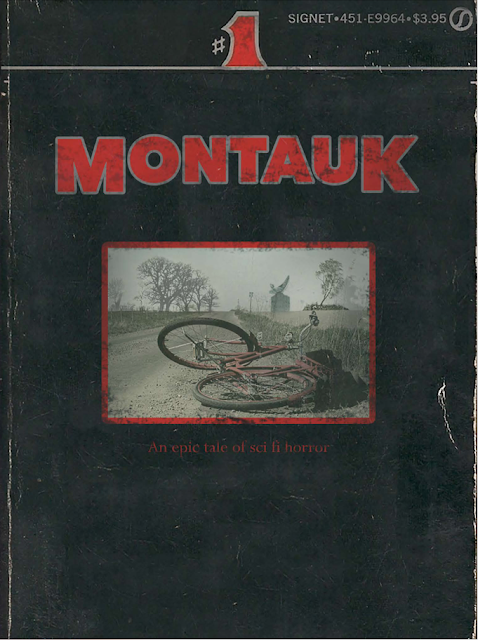 It's wild and wacky, and I never ran it as our game morphed into a game of CJ Carella's Witchcraft. However, the Taroticum of the game, KULT, has appeared again with the new edition (Divinity Lost) and the cards are available to purchase. The Major Arcana are radically different to normal cards, 0 representing the Awakened Man (Anthropos) and 1 representing "God" (The Demiurge), 2 representing "The Devil" (Astaroth) , and the remaining 20 cards each for the 10 Archons and 10 Death Angels. The Minor Arcana is FIVE suits, rather than four, numbered 1-9 (no court cards) with each suit tied to one of the five paths of awakening - Death (Skulls), Passion (Roses), Time & Space (Hourglasses), Dream (Crescents) and Madness/Elysium (Eyes). Having the suits represent actual elements of the game, like the Mage Tarot, has been a bit of an inspiration too. But I've gone on too long for this post. Next post will be about how I'm using the Tarot in WILD, and maybe a look at other games that use Tarot for task resolution in tabletop roleplaying. Until next time, may the cards be in your favour. Let's get back to normal things shall we? By that I mean my usual mix of nostalgia, game design and rambling on about stuff. I had this weird idea a number of months ago to do a few blog posts about Tarot. I know, it's weird, but I've always had this strange fascination with Tarot. One that I remember from my dim and distant childhood and has stayed with me right into the development of my roleplaying game - WILD. 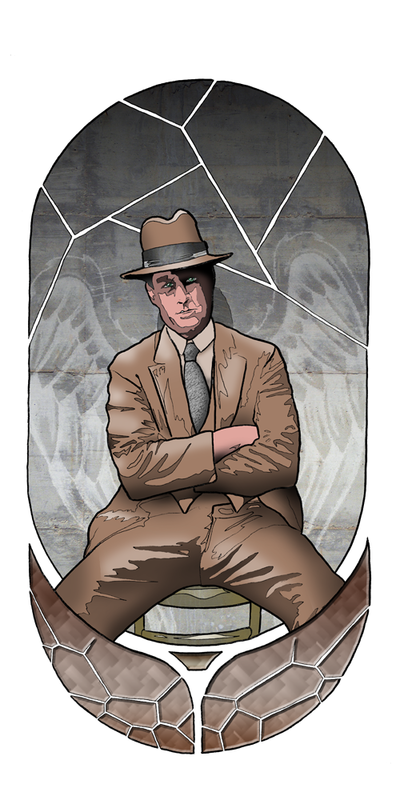 The first real memory I have of Tarot is from James Bond. My parents got me interested in movies at a young age, and one of the first movies I remember them taking me to see was The Man With the Golden Gun. I was instantly hooked. My mum dug out her collection of Ian Fleming novels for me to have a look at and one of the first records I ever bought was an LP of James Bond themes. Yes, I got obsessed with things very easily. I guess some things never change! But this was the late 1970s, and we didn't have things like video recorders and so on. Luckily, in January 1980, ITV in the UK showed Live and Let Die for the first time. In the TVTimes before it aired there were production drawings and designs for the gadgets and the stunts, and I kept those pages for many years to come. 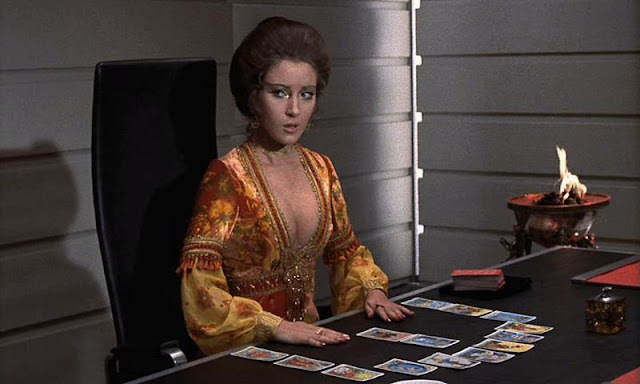 However, during Live and Let Die, the now famous scene introducing Jane Seymour's character - Solitaire, I was a bit confused by the weird cards she was using. Colour me sheltered, but up until this point my eleven year old brain was purely focused on spaceships, lego, and Star Wars figures, and certainly not on the esoteric. My dad told me about Tarot cards, and how they were used for fortune telling, but they sounded weird and mysterious, and not to be messed with. It wasn't long after this that my father bought his first (and to my knowledge, his only) deck of Tarot cards. Maybe he was as inspired by watching Bond as I was? Dad was always intrigued by these things and I remember him bringing the pack home, though I wasn't allowed to play with them. Course, it wouldn't be long before my obsession with James Bond movies would collide with my biggest pastime - tabletop roleplaying games. When the James Bond RPG came out from Victory Games I was not only amazed at the incredible production values, but the game was fantastic too. We played a LOT of sessions of the Bond RPG. A LOT! But something was different about the Bond RPG. Due to the licensing issues at the time, a certain villain and his vast organisation that featured so heavily in the movies could not be used. Instead of Ernst Stavro Blofeld we had Karl Ferenc Skorpios. And instead of SPECTRE, we had TAROT. Dad eventually decided he was never going to use those Tarot cards, and gave them to me. I still have that set now - the "Tarot Fortune Telling Game" as it was called came complete with a book to assist in working out the divinatory meanings of the cards, as well as a sheet that showed you where to place the cards, and explained what each card position meant. My dad's one and only Tarot set, purchased in the early 1980's. They weren't anything too fancy or pretty, very old and traditional illustrations. I don't know if it's because the names of the cards were in French, but they felt mysterious. Like that book cover of a horror novel that scares you but you can't help but look at. I never did a reading, looked at the cards once in a while but didn't really return to them for many years. I had left school, was unemployed for a little and, after a spell working in Nature Conservation and Archaeology, had gone back to college to do art and graphic design (much to my mother's delight). At the end of my BTEC the course tutors were really keen to get all of their students onto degree courses around the country. While initially I wasn't too fussed about going away to a university, I still applied as it kept the tutors quiet. My first couple of choices of places to go didn't accept my application, but my third choice asked me for an interview. Before the interview, well in advance, the University sent a letter - an assignment that was part of the interview process. I was tasked with painting, drawing, sculpting or whatever, a self portrait. For some strange reason, I can't remember why, I decided that for my self portrait I'd create a deck of Tarot cards. Time was limited, so I focused on the Major Arcana. To make it a self portrait, I looked at the meaning of each of the cards, and how that related to my life at the time. Then, I got some friends to take photos of me in various poses, and used them as a basis for a mixed media collage for each card. I know, it's a pretty lame idea, but it seemed to be okay. The cards were very oversized - each one A5 - and I created a box for them with a suitable quote from David Byrne on it: "People will remember you better if you always wear the same outfit." As I always wore completely black, I thought this particularly apt. My first, rather bad, attempt at creating my first Tarot deck, as part of a self portrait assignment for University. It seemed to work as I was accepted at the University, and while I could tell the tutors in the interview were underwhelmed by my portfolio, they liked the originality of a self portrait presented as Tarot cards. I'll continue the Tarot stuff later, looking at my favourite decks, and look a bit more at creating a specific deck for WILD. Until next time, who knows what fortune awaits? I posted at the beginning of January about how life had become stuck in a holding pattern for the duration of the festive period, and I was now approaching the start of the new year with a new vitality and determination to get back to the writing, to do... well, stuff. All that fell by the wayside. I got sick. Nothing major, just a bad case of the flu, but it knocked me out for a couple of weeks. Literally in one case. I remember sitting up in bed and then blacking out completely. Totally unaware of where I was. It was weird. And, being the sharing type, I gave the flu to my wife as well. This period of being ill had an adverse effect on the third member of our family, Marla - our fur-baby. 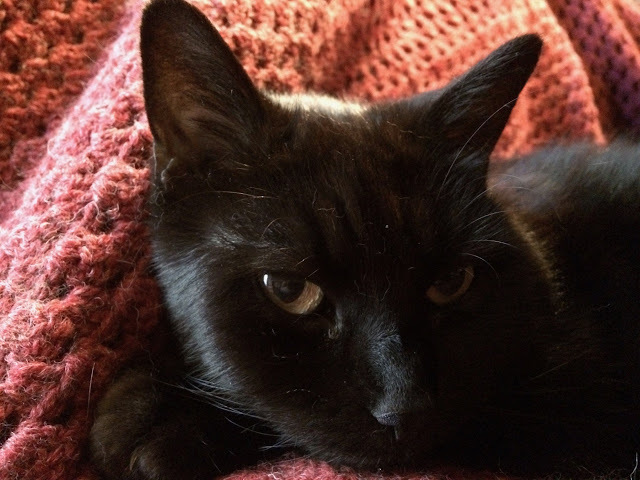 She does get stressed easily, and a combination of her worrying about our weird passing out and sleeping all day behaviour, along with some dental issues that we were initially unaware of, meant that she stopped eating at all and there was an incredibly stressful number of weeks where we feared the worst. We didn't know what was wrong with her, many trips to the vets, blood tests, medication and trying to feed her recovery food (a weird meaty paste delivered in a syringe) every few hours, squirting the paste onto our fingers and letting her lick it off while she hid under our bed. She was booked in for dental surgery, but her bloodwork was worrying, and we were panicking a little to say the least. She was due to have all of her teeth out, but luckily they only removed two, cleaned the rest, and after another week of medication she's almost back to normal - as is her bloodwork (seems the worrying levels were purely from her not eating). She's a little nervous of noises, convinced she's going to get put in the carrying box again and taken to the evil vets, and she's clingy with us - which, let's face it, is nice to have lots of cat attention. Now that those worries are hopefully behind us is it time to finally disengage that holding pattern? I hope so. But with very little writing work being offered to me, very little communication from anyone really, I need to get back into the swing of it. But I'm having my doubts about the core game mechanics for WILD, and I need to get my head back into the game. The last year has felt like one big holding pattern. Circling, endlessly, waiting for something exciting to happen. For that phone call. That email. For someone to come along and say "Hey, I like your ideas. You need to work on that, rather than wasting your days in retail. Here's a handful of cash. Make your dreams a reality." Of course, it never really happens like that. You have to reach out and grab opportunity by the gronk-nuks. I had my share of waiting last year. That holding pattern of self doubt. Convinced that after my last professional writing stint that I'd never get a publishing contract again. Convinced that all of my ideas are nonsense. But I mustn't give up. I can't give up. There have been times last year when I seriously thought I should just pack in the writing and resign myself to my fate - one of retail, customer service and the hell I deserve for my past mistakes. But I can't do that. I've been trying to get into game writing since the late 1980s, got my first published game product on the shelves in 2002, won awards for game design and writing. It's what I want to do. Or something like it. With Dragonmeet looming at the end of last year, I decided that I needed to sell myself. I needed to prove to someone, as well as myself, that I could do it and that my own project was worth taking a chance on. So I decided I'd produce a small sample - a pitch document, just as we had with Doctor Who over ten years ago - to show my wares and my ideas. I produced a forty page book - half of it a "pitch" summarising the concepts and ideas of WILD, the RPG I've been working on for years. The other half a sample of one of the chapters, to give a feel for the text, and how I'd envisioned it being laid out. With the excellent service of a digital printer (www.inkylittlefingers.co.uk) this book was printed, in black and white, with a hardback, full colour cover. The "Pitch" half of the document summarises who I am, and the concepts of the game. Awesome. And despite me sending the files off to the printers with just ten days to Dragonmeet, they delivered with days to spare. Three whole copies of the WILD pitch. THREE. Talk about limited edition! Dragonmeet was cool. Busy and exciting. Huge as well. So much bigger than last time I'd gone. I'd only been there a matter of minutes before Dom from Cubicle 7 dragged me off to a secluded location to record a podcast for "Wibbly Wobbly Dicey Wicey" - a Podcast dedicated to Doctor Who roleplaying. That was great fun - I'll post a link to the podcast when it is published. I showed the pitch off, and hopefully there will be some news about the future of WILD soon. But I don't want to jinx it. I'm just going to keep plugging away at it. Writing the pitch document has revealed some areas I want to rewrite and redesign, which I'll start work on in the next few days. After Dragonmeet it was a most definite return to the holding pattern - unable to work on anything except the dayjob and madness that is working in retail over the festive period. With just a couple of days before the kids go back to school, things will return to a slower, calmer pace and I can reassign some energies to working on the writing, and what I want to get done this year. Most blogposts posted to the interwebs on the first of a year is all about the writer expressing their hopes and dreams for the coming year. I hope to escape the day job - but I know this is unlikely. Gotta pay those bills! I hope to escape the city - I'm a country boy at heart. 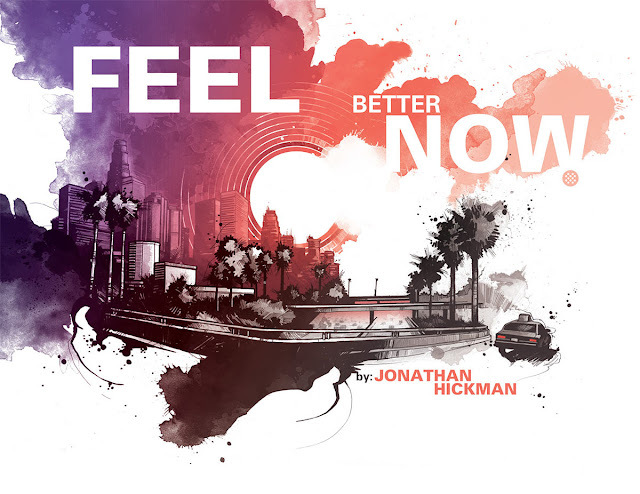 With that, I'll close the blog with a track from my wife's favourite band of the last year. May 2019 bring you everything you hope. May it be kind to you, bring you prosperity and good health, and bring your dreams to life. This is probably going to be the last blogpost until the new year, so I just wanted to wish you all the very best for Festivemas, and let's hope that 2019 is a better one. Christmas is a painful time for me. Nineteen years of working in retail has driven any glimmer of festive cheer away, and has reduced it to a state where I look forward to Boxing Day - knowing that it is over for another year. We have zero money this year as well, so watching people spending, and spending, and spending is great for the dayjob's business, but not so great on my mental wellbeing. Every transaction I run through the till is reminding me that I can't afford to buy anything for those dear to me. So. This year, I'm sorry we're not getting everyone the gifts we'd like to give you, but know we're thinking of you. In the new year I'll return to the blog and fill you in on all the game design developments and my hopes for 2019. Wow, has it really been a month since I posted on here? Sorry to the two or three people who still read my ramblings on here. I'm sure it'll get better in the New Year. I've been busy this month getting a sample of my RPG WILD through layout and adding a pitch about the setting and system to see if I can get someone interested in getting me motivated again. Hopefully, it'll be back from the printers in time for Dragonmeet (fingers crossed) next weekend - not that I've had many printed as I have zero money!! Way back in January I posted that I'd submitted the manuscript for a completed project - one that I had great fun doing, and really surprised me in more ways than one. Well, it looks like that project has gone to layout and should be available in a couple of months or so. That project is "Ghostbreakers: Spirits of Manhattan" - the next in EN Publishing's WOIN Studios line. WOIN Studios are the producers of film and TV projects in another reality, and EN Publishing has managed to secure the licensing deal for some of their properties for publication in our world. 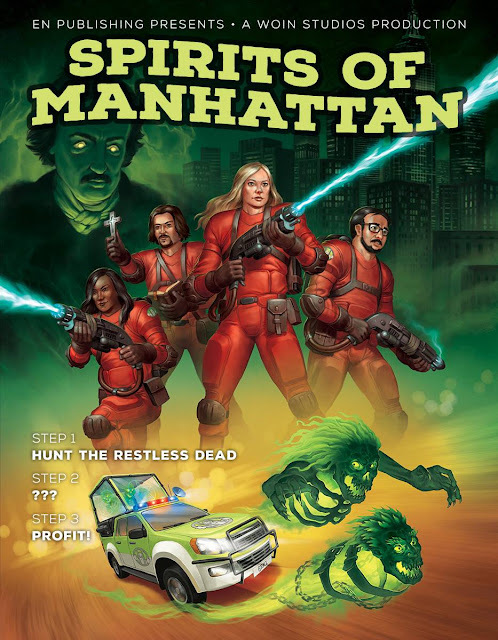 Ghostbreakers: The Spirit of Manhattan lets you play the characters from the highly successful first movie in the Ghostbreakers series, or to create a new "franchise" of Ghostbreakers hoping to save the world from ghostly and demonic invaders. I won't go into any great detail, but I must admit this really surprised me. 70-80% of the book is an adventure - something I haven't really tackled for a long time, choosing more recently to concentrate on settings and systems. I wasn't sure if I could do it, but I got VERY into the swing, creating the setting, rationalising how it worked, as well as detailing the many, many sequels that followed this first "movie". It was strange going back to that style of writing, but it was a blast. And above all, it was great to write something funny. After all, we all need a bit of a laugh at the moment. But I should concentrate on WILD and not get distracted unless another paid gig should come along? It is #WorldMentalHealthDay, or #MentalHealthAwarenessDay depending upon which hashtag you're following on the various social media thingies... and I've just finished my last CBT seminar hoping to get me into a routine, sort my behaviour patterns out, and improve my mood. I've been feeling better since my post at the beginning of September, but I need to keep to my plan to avoid social media. I've found myself slipping again and passing hours just staring at Facebook or Twitter, seeing if something exciting has happened. I do just need to get on with my own stuff. So, as part of that "do my own thing", I've been thinking about my RPG - WILD, and acknowledging a problem I've had with it since I started working on it so many years ago. It's all about mental health, and motivation. together with the supplements, uniting the middle image. The problem is, I'm doing WILD for me. There are no publishers involved. No deadlines, no one to disappoint but myself. And, due to that, it has taken forever to get anything done with it. I'm so good at talking myself out of it, saying "No one's going to want to play it", "You can't afford to do it, not even with a Kickstarter", "You have no experience in publishing a game," right through to "People find hearing other people's dreams boring, why would they want to play a game of it?" I figured, if I wrote a pitch. A summary of what WILD is, explaining the setting, the basics of the system, how I wanted the game to be presented, and a sample of what I'd written, I could put it together in a document I could give to potential partners and see if they'd be interested. 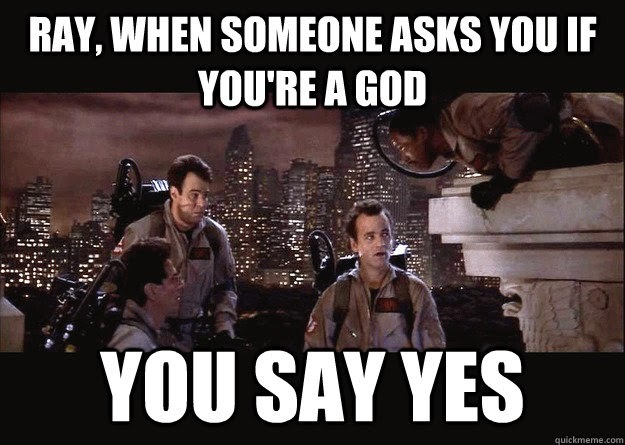 become the awesome Stranger Things. A good friend of mine and ex-dayjob work colleague, Alrissa, for her final project for her degree produced a children's book. She had a few printed, only three or four if I remember correctly, but the wonders of digital printing means that you can do a very small print run as a sample and hopefully get people interested. After doing some research, and finding what can be done and for what price, I'm sure this is cool idea. So that's what I've been doing with my time. I've been working on a pitch for WILD to show to potential game companies that have partnered with people for Kickstarters in the past. There's no commitment from them, but if they say they're interested and would do the game with me, I have the added motivation to actually get the darn thing finished. The original printed pitch given to the BBC for the Doctor Who RPG. Very, very few of these exist. Until next time, look after yourself and each other. Yes. I have a problem. I'm a little obsessed. 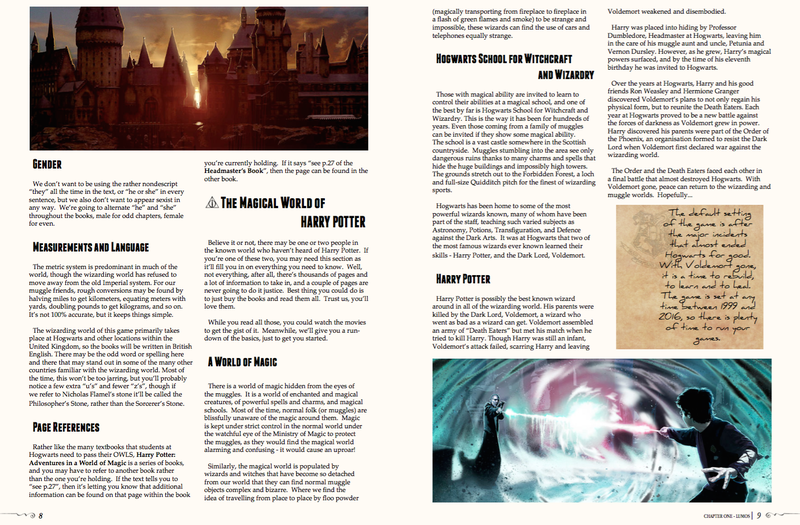 I've said it before, and I'll say it again - I need to write the Official Harry Potter tabletop roleplaying game. Not some "numbers filed off" unofficial one. I need to write an official, licensed RPG set within J K Rowling's Wizarding World. The frustration that there isn't one, and that I'm not involved, ebbs and flows but it is times like yesterday when the leaked footage of an awesome looking video-game RPG within the Wizarding World hit the internet, that I start screaming at my computer. First of all, about that video game footage. It looks amazing. I'm so glad I wasn't part of their focus group as I would have been leaping about the room, making noises like a Fwooper. It's a great studio behind it if the rumours are true (Avalanche who did Disney Infinity), and the game looks stunning. Like Portkey Games and their Hogwarts Mystery game, they've been sensible and set the rumoured RPG in another time period to avoid clashing with the events of Harry Potter (and Fantastic Beasts). And like Portkey's Hogwarts Mystery it tells a new story within the Wizarding World, with new characters visiting familiar locations. So the question is, if this fantastic video game, as well as Portkey's Hogwarts Mystery, can tell new stories at Hogwarts (and in the Wizarding World in general) that are not necessarily considered canon, why is a tabletop roleplaying game any different? I'd just love some answers. If it's fear of players creating their own stories and adventures within the Wizarding World, in the games they play and create sitting around a table, it's not like it's that far from fan-fiction. It's not making money and it's certainly not considered canon to the universe. If it's worry about the potential publisher creating new stories and adventures, I'm sure that any adventure idea would be vetted by Warner Brothers, and is it that different from creating the narrative of the video games currently published or in development? When Portkey first announced their games there was a section in their FAQ's that said J K Rowling would be approving everything - a line that was removed a few months later making it seem like the developers have been given a little more free rein. Is it just about the money? While a Harry Potter tabletop RPG would be huge in the games world, the tabletop games industry makes a fraction of the money that a video games company would. That same post also details my first attempt at pitching to Warner Bros with the support of a major game company, and how it didn't get very far. I have to wonder if the thing that stopping a Harry Potter RPG is not speaking to the right people? Or getting through to them in the first place? When we pitched (successfully) to the BBC for the Doctor Who RPG, I learned that a factor in other companies' attempts at the license may be purely down to them not getting through to the right person with their proposal. Why is there no Harry Potter / Wizarding World tabletop roleplaying game? If it's purely financial, I can understand that - I'll just have to hope either to gain the backing of a successful and fluid publisher, or hope for a lottery win. 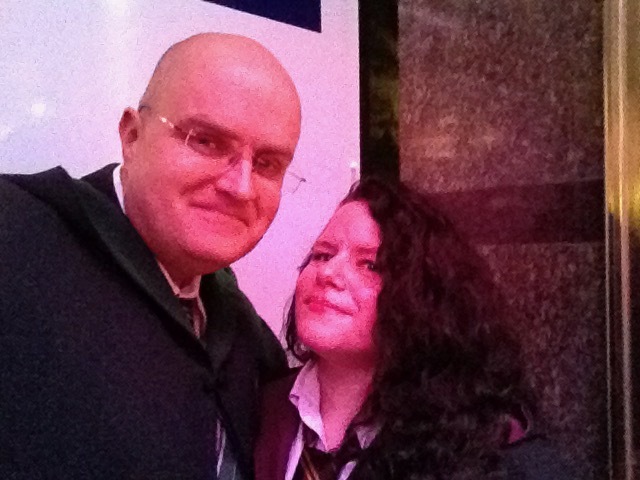 Of course, if a publisher is already working towards a Potterverse game, please let me know! If it's about creative control, then why can video games companies do all of the things that seem to hold a tabletop game back. Now that #RPGaDAY is over (once again, thank you all for taking part) I'm going to address something that needs sorting. I really have a bit of a problem. I have no attention span, I can't concentrate on anything, and before you say anything - yes, I've been to get medical help. It's coming. However, it's obvious to me that I have a major contributing factor to my mental wellbeing, and that's social media. I spend a hell of a lot of time on social media. I'm checking Facebook and Twitter every hour at least, and it's really not good for me. Reading one bad post can have me mentally spiralling and I spend most of my time worrying about crap that really doesn't affect me or have anything to do with me. For example, here's how my brain worked a couple of weeks ago when the fantastic news was announced of a new Dune RPG from Modiphius in association with Gale Force Nine. It started as "Holy crap, someone's got the Dune license! ", through to "God, I'd love to work on Dune. Dune is one of my favourite books, and I'm obsessed with the David Lynch movie." It quickly progressed to, "I should drop Modiphius a line," to "But I dropped out of working on Star Trek. They probably hate me for letting them down. I was their line developer and I walked away." By the end of the night, I was convinced that nothing I wrote was any good, that I could never do Dune justice, let alone any other licensed property I could ever hope to work on. That no gaming company would ever want to work with me again. That I should just give up game writing, and just stick to my day job in retail. That I'm fifty and I work in a shop. I'm going to be trapped there forever. I'll retire and all I'll have to say is that I worked in retail. I'm too old to get a new job, no one will hire me. All that, from some good news in the gaming world. Imagine what my head does when the news is less than positive. Right in the middle of a mass social media initiative to spread some positivity about gaming I realised I needed to take a break from social media. I'm still going to write blog posts - there is something therapeutic about it. And I've an idea for a series of posts about Tarot that'll get me back into WILD writing. I'll still post links to these blog posts on Facebook and Twitter, but that's about it for a while. I'm hoping that this extra time, away from staring at the computer screen, will mean I'll be more productive, and my concentration will return. I'm down, but I'm certainly not out. 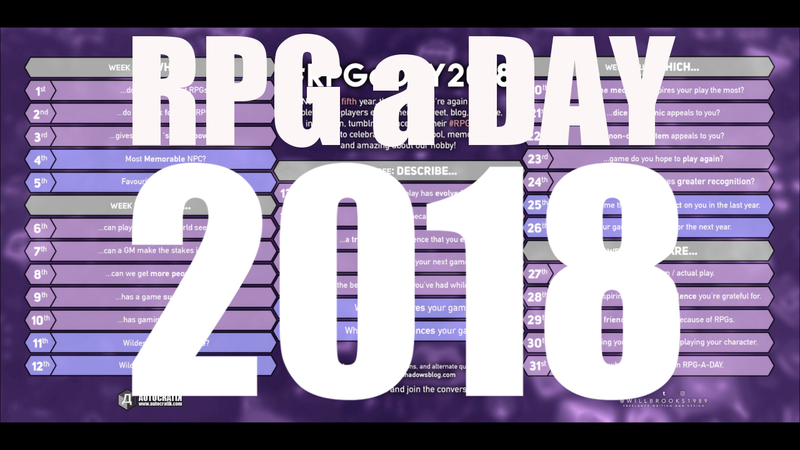 #RPGaDAY2018 - DAY 31: Share why you take part in #RPGaDAY? It's the thirty-first. The final day of #RPGaDAY2018 and today's question - the final question of this year's #RPGaDAY initiative - has again been supplied by M L Straus (The OG GM Adventures Youtube channel can be found here! Check it out, and subscribe!). The final question asks us to share why you take part in #RPGaDAY. A great question, and I'm really looking forward to the answers. I've made it plain why I started #RPGaDAY in my many videos and blog posts, so I'm not going to answer this one. Instead, as it's the last day of #RPGaDAY for this year, I'm going to thank all of you for taking part. This year has been huge. We've gone from a few hundred people taking part, to the Facebook page alone getting thousands of views a week, and that's without considering those taking part purely on Twitter, or G+, etc. Thank you everyone for joining in, and spreading the positive message of our hobby. One thing I have noticed this year (I don't know if this is just me not hunting it out) but there certainly seems to be far less of a negative reaction to #RPGaDAY than in previous years. Hopefully, it's doing what we'd hoped and keeping things positive. A few things I'd like to say before this year's #RPGaDAY comes to an end. If you get the chance, if you haven't already, head over to the Facebook page and click "like". You won't be spammed with loads of messages - it's very quiet on there most of the year, and there are only a handful of extra posts short of the one per day during August. But it'd be great to see you on there. I'd also like to thank Anthony Boyd and Will Brooks. Without them, there would be no #RPGaDAY. Anthony helped run #RPGaDAY in the couple of years that I didn't feel up to organising it, and this year his help has been invaluable. I really couldn't have done any of this without him. Will is a complete legend of graphic design and illustration - working most of the time on the covers for Titan Comics' Doctor Who range. I've known him for many years, and his eye catching graphic is iconic and helps distinguish the #RPGaDAY posts every year. Until then, until next year... thank you again.